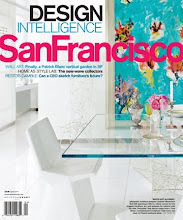 San Francisco Decorator Showcase opens this week with patron and benefactor parties and the big reveal of exciting work by more than a hundred top designers, architects, accomplished crafts specialists, artists, special fabricators, and the best of the best talents in San Francisco. 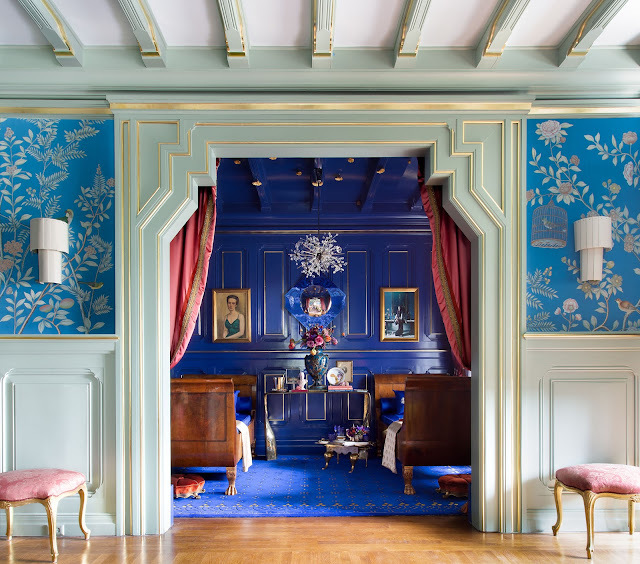 It’s an extraordinarily inspiring house this year—rich with ideas, inspirations, vivid creativity and extraordinary leaps of the imagination. I had a special preview over the weekend, and it is, I believe, the best showcase in the four-decade history of this fund-raising event for University High School. From the extraordinarily accomplished first-floor rooms, and up the stairs to the bay-view rooms, (and downstairs), the décor is polished, thoughtful, super-elegant, sumptuous, chic, subtle, and highly original. Inspiring. Come with me for a first look at a highlight of the house, the bold and superbly detailed decor by Jonathan Rachman, the upstairs living room and salon. 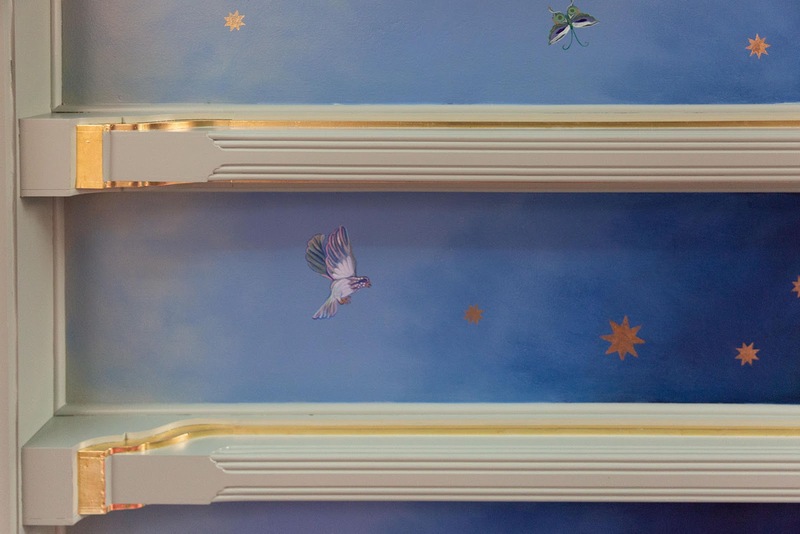 Jonathan’s design is a sumptuous and wonderfully personal homage to the English country house style. 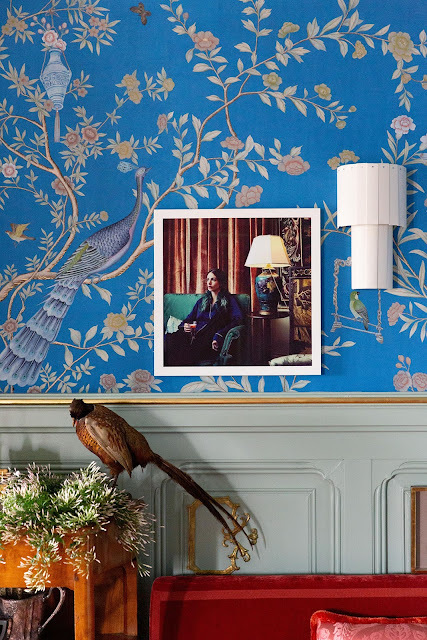 The design inspiration came from twenty-two highly detailed panels of exquisite new hand-painted wallpaper by de Gournay. 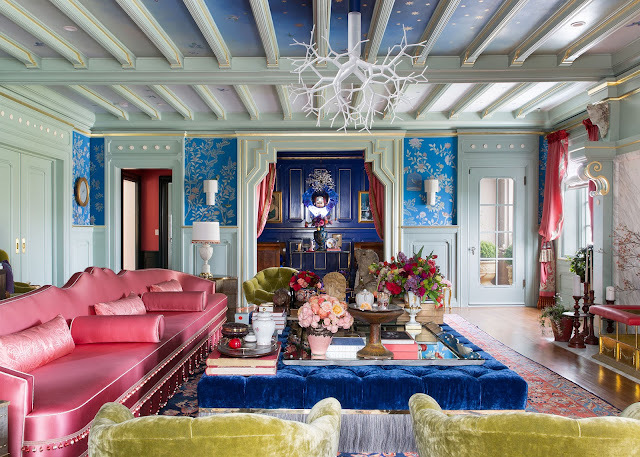 In particular, I admire Jonathan’s orchestration of vibrant color with a dash of eccentricity. 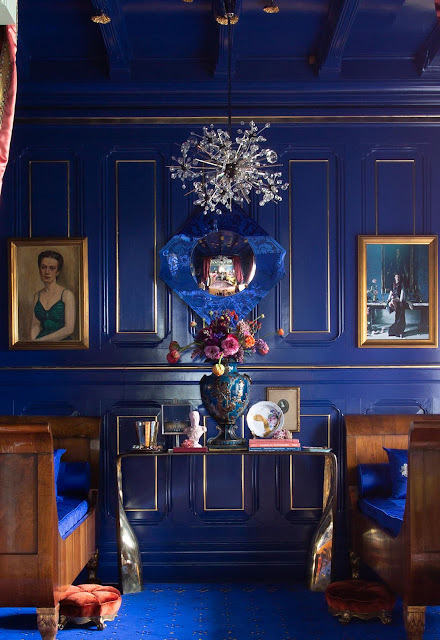 It’s an elegant bohemian room with wit and fun, and the kick of a new generation of ideas. I love it. 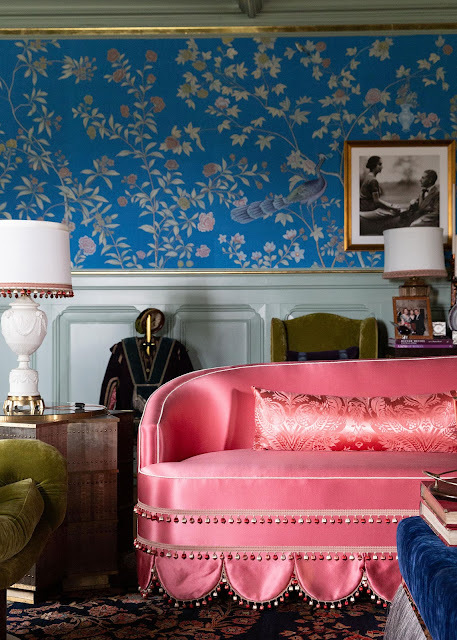 Jonathan Rachman’s room is super-charged with glamour with an edge. 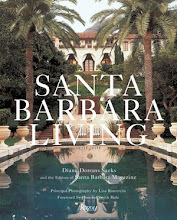 He started with the strong structure of beamed ceilings, a massive scrolled fireplace, double doors, a powerful dimension, and windows overlooking the Presidio and the misty bay. Jonathan noted that the entire room was inspired by the silk de Gournay wallpaper. It’s in a mysterious and elegant antique China blue, with a delicate Chinoiserie design that dates back to the late eighteenth century. 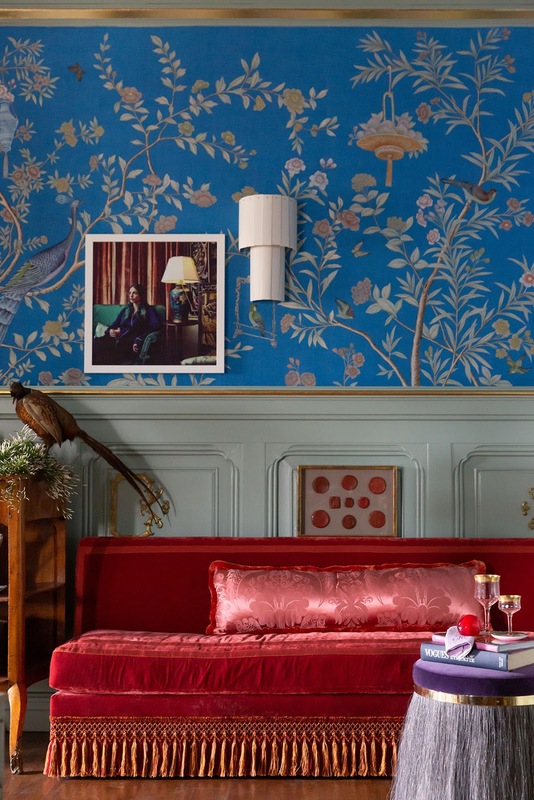 De Gournay, an international design firm based in London, are experts at re-creating historic and authentic wallpapers. 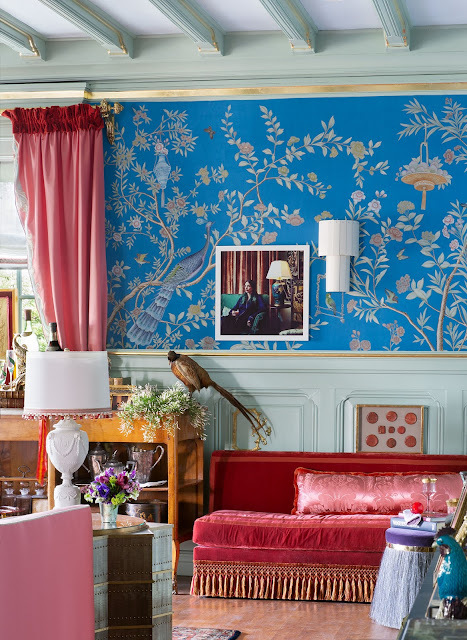 This one is based on a hand-painted wallpaper originally created for Houghton Hall in Norfolk. Houghton is one of the grandest stately homes, and the residence of David Rocksavage, the Marquis of Cholmondely. 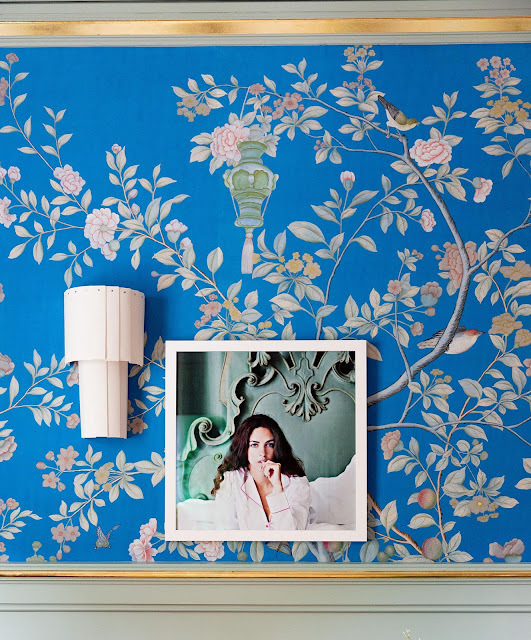 His lovely wife, the Marchioness of Cholmondely, Lady Rose, recently contacted de Gournay about reproducing the original wallpaper. 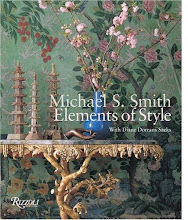 It’s a triumph, painted in the most exquisite detail with a flourish of peonies, exotic birds, blossoms and arching leaves and branches. Dazzling. 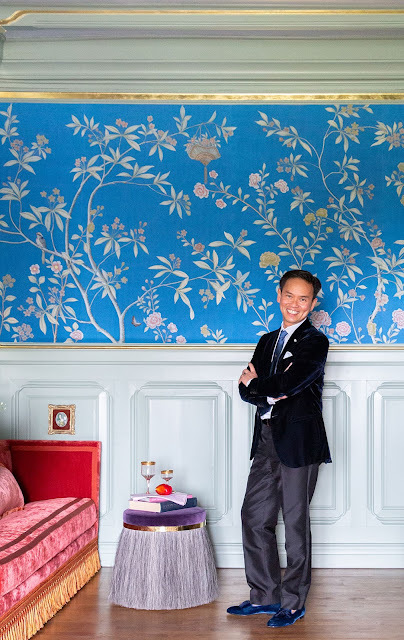 Jonathan Rachman, originally from Sumatra, was educated in France and Switzerland, and has always had a collector’s instinct for getting to know the antiquaires of London and Paris. He has had a longtime love affair with the English country house, with all its eccentricities. 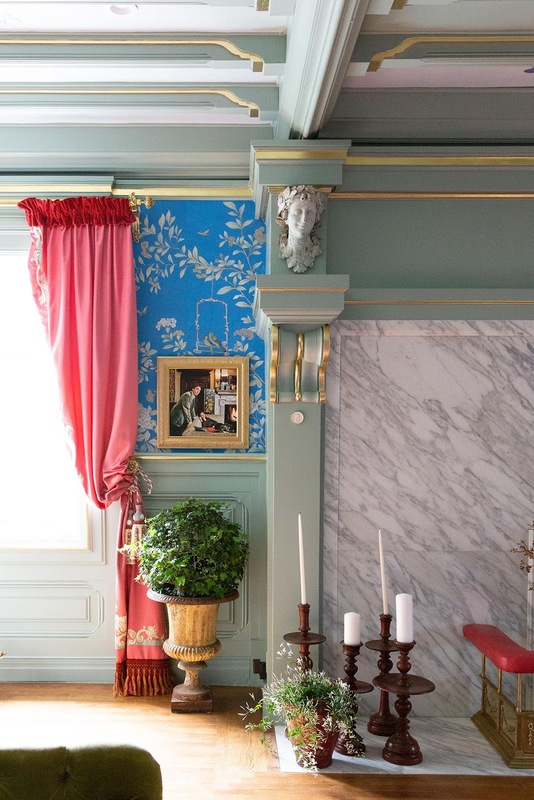 One nod to heritage is his moss green ‘Rite Of Spring’ paint on all paneling, woodwork, and framing. It’s given the spark of elegant water-gilding accents. And there’s the Dior-inspired dusty rose satin-upholstered sofa, with frou-frou trim and bolsters. Rachman worked closely with teams of decorative painters (the birds and stars and insects on the ceiling reward close inspection), as well as gilders, embroiderers, marble fabricators, and the artists of de Gournay. “I love to collaborate with my upholsterers and artists, and every creative person who contributed so much joy and life to this room,” said Rachman. De Gournay has a showroom on Sacramento Street, Presidio Heights, in San Francisco. 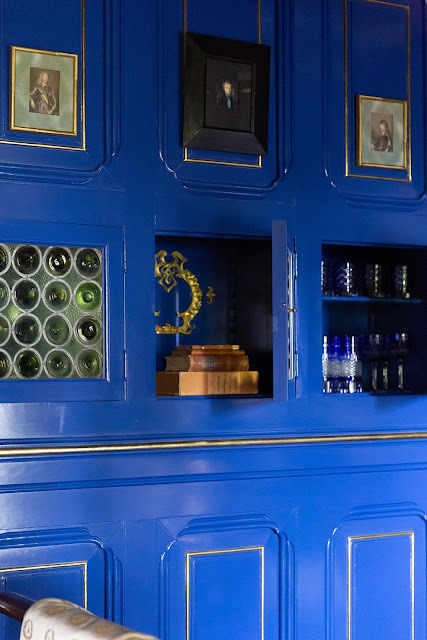 Rachman is an expert at detail and invention. 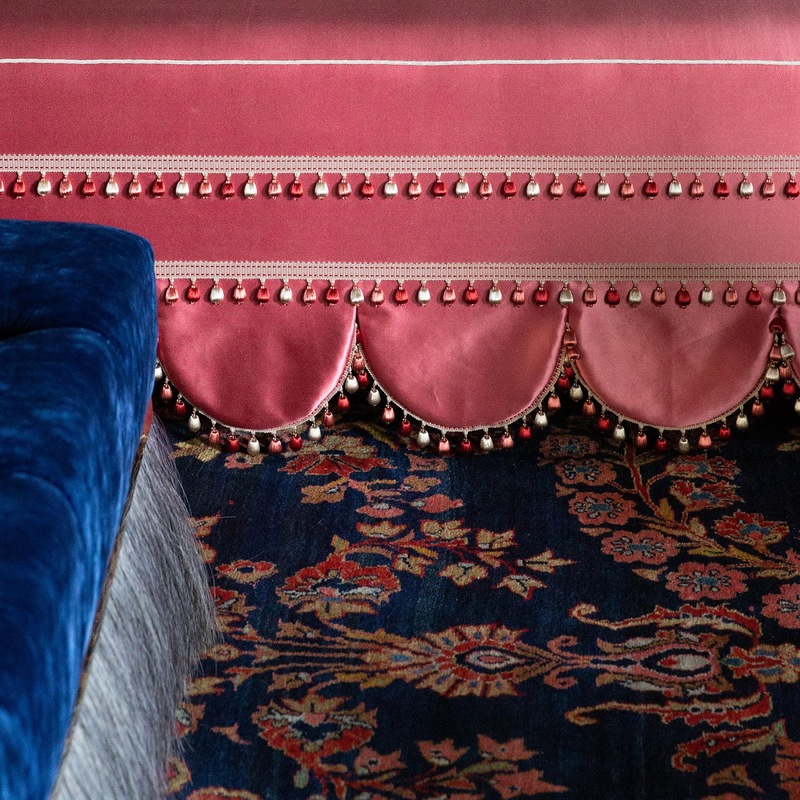 Tufts of natural horsehair spring from the impossibly glamorous ottoman. 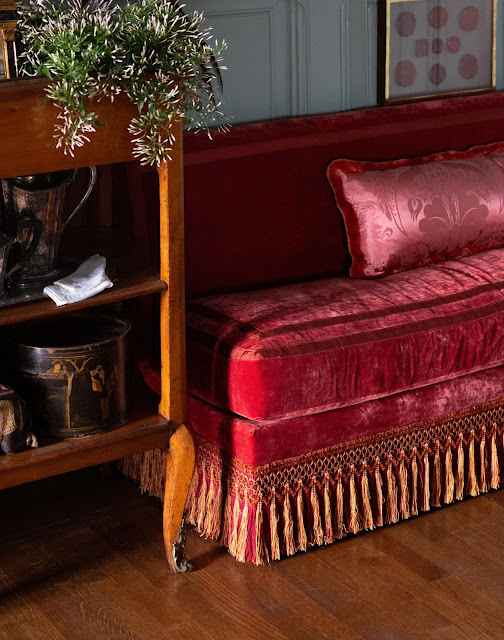 Orange fringe and orange tape by Samuel & Sons add the shock of color on a pair of chic raspberry velvet banquettes. 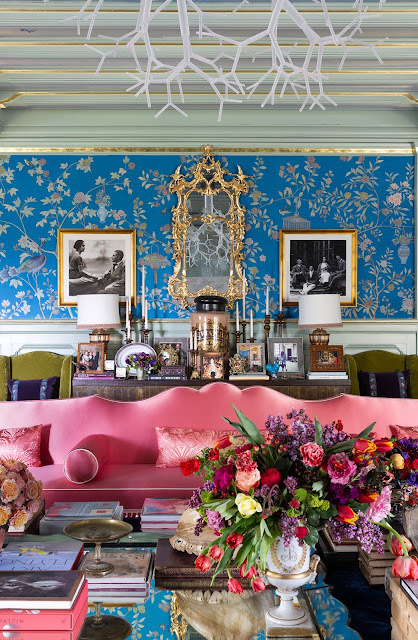 This room is an homage to the art and craft of de Gournay…who now offer appliquéd satins and silks, along with hand-painted porcelains and new brocades, a pair of wing chairs, antiques and objects. 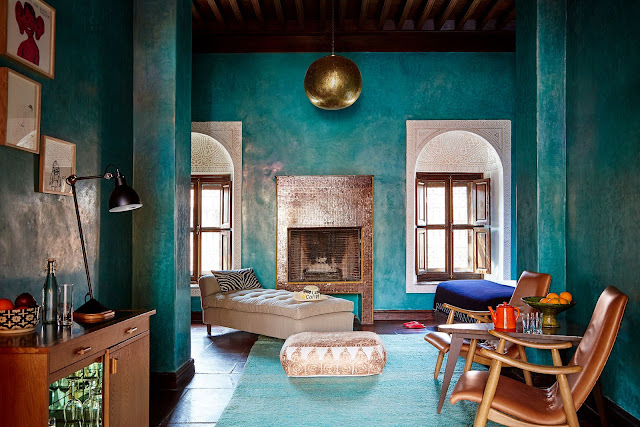 And its an ode to fine craftsmanship, extraordinary upholstery, weaving, passementerie, with the clash and dash of a quartet of fifties bronze-based chairs with chartreuse silk velvet upholstery. There’s an antique Lobmeyr chandelier, and Lex Pott’s modern acryclic ‘tree of life’ overhead. 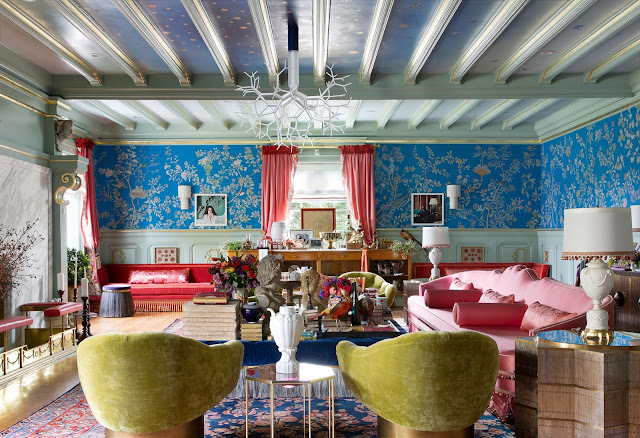 And there are the four Coup d’Etat swivel armchairs, their strong sculptural shapes in confident juxtaposition with the swooping silhouette and rosy countenance of the ultra-long 15-foot sofa. Maximal, yes. Tongue-in-chic wit, definitely. 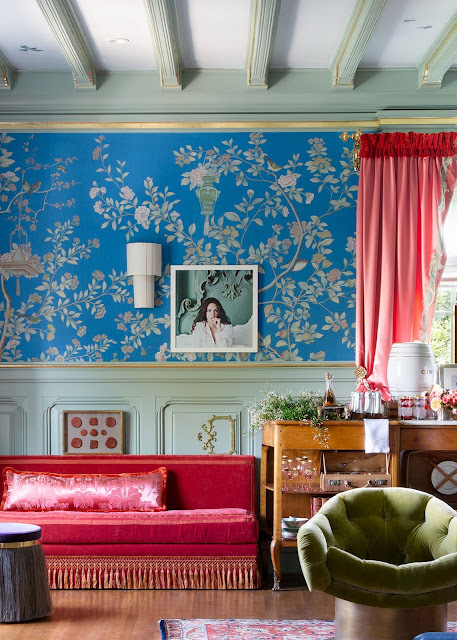 And a new way of honoring tradition—with rollicking color, carefree delight, and iconoclastic confidence. This year’s San Francisco Decorator Showcase is presented in the Presidio Heights neighborhood of San Francisco, with views of San Francisco Bay. 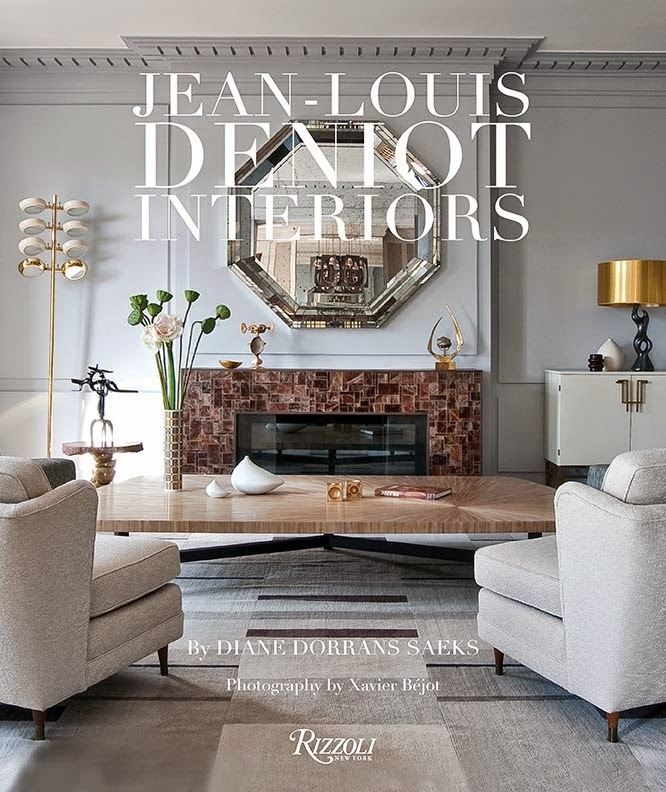 More than fifty top interior designers, landscape designers, architects, artists, creators and teams of accomplish crafts specialists have transformed the interiors and gardens. 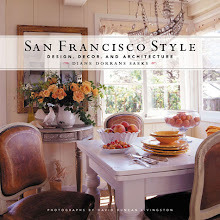 The annual San Francisco Decorator Showcase benefits tuition for San Francisco University High School. 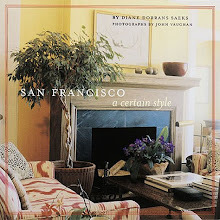 San Francisco Decorator Showcase began in 1977. In its first year, the Showcase netted $26,000, and today this prestigious event raises over $500,000 annually. 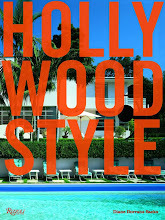 Jeffrey Fulgencio, in-house photographer at Jonathan Rachman Design. My recent trip to Morocco was full of discovery, new friends, days of adventure. 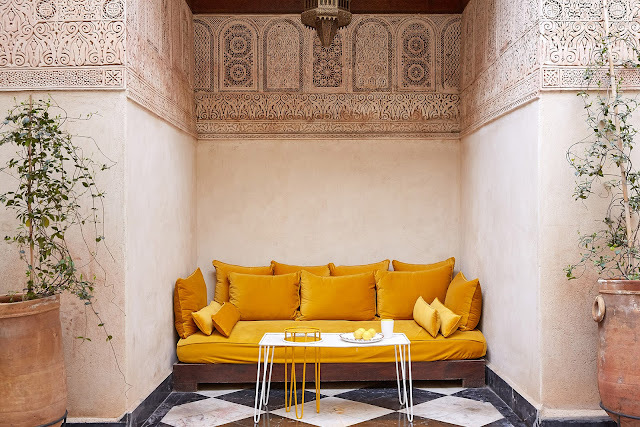 I went deeper into the mysteries of the Medina, finding new places, fantastic interiors, a new museum, and dramatic Moroccan décor. 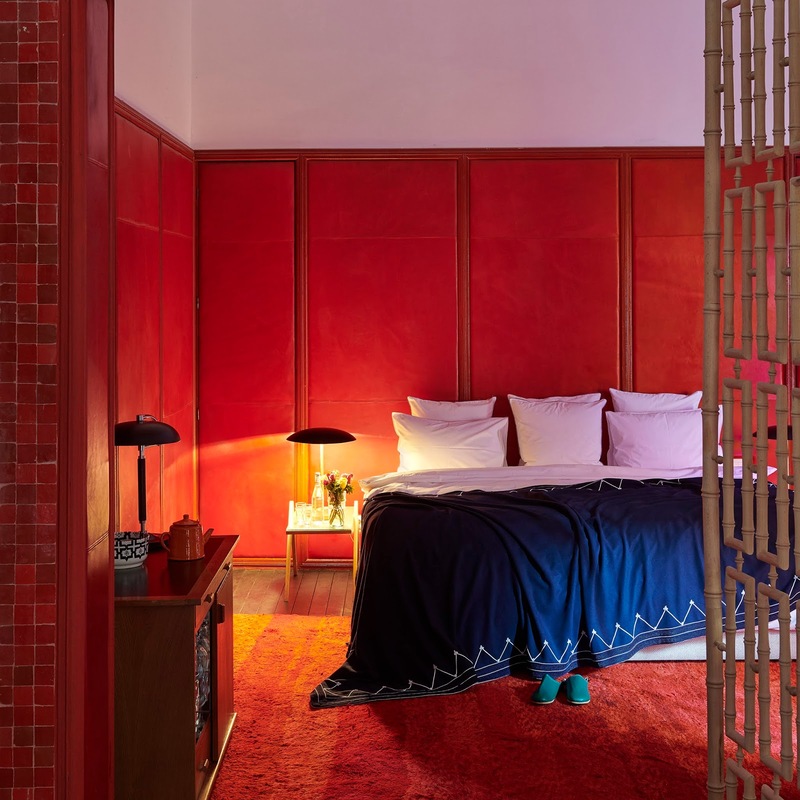 My long-time friend Madeline Weinrib recently became a partner with Vanessa Branson in the trend-setting El Fenn hotel in Marrakech, and she invited me to come there for a visit. 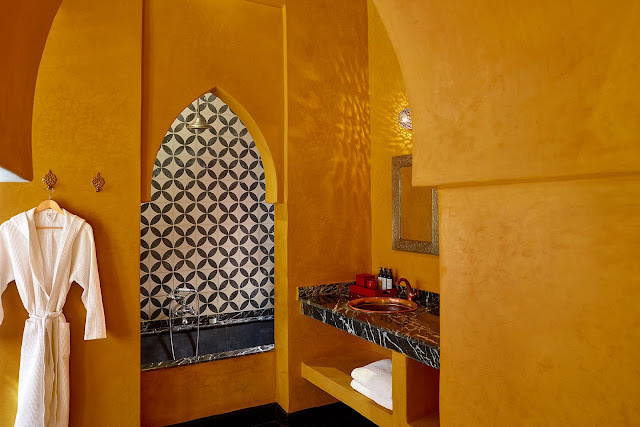 El Fenn is perfectly sited right on the edge of the Medina, and in the middle of all the exciting souks and shops and artisan and crafts galleries. 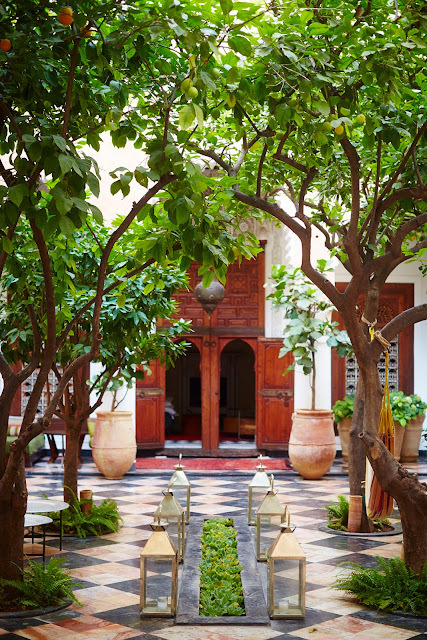 El Fenn is a fantasy, a labyrinth of several historic riads joined together. 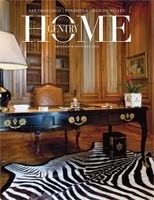 It’s all very hidden, tranquil, ultra private, elegant and witty and brilliant. 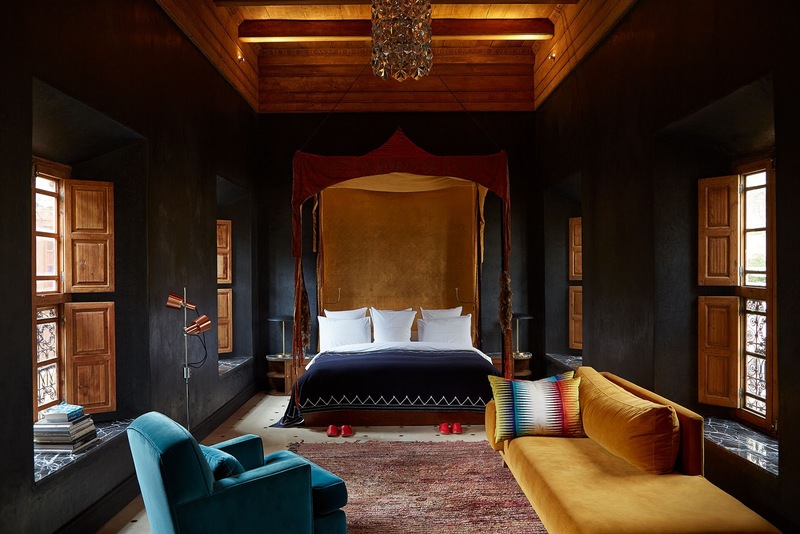 Vanessa Branson and her team created theatrical and ultra-cool lodging in the heart of Marrakech. This series of courtyard riads is vivid with bold Moroccan colors, and all rooms have swagger and style. 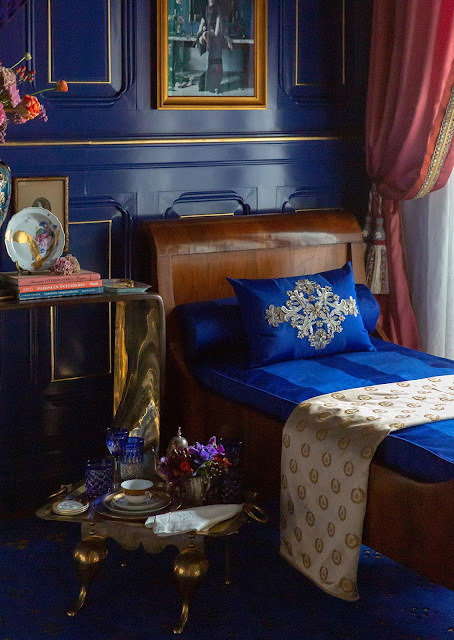 I invite you to sip mint tea with me and Madeline for a chat about the hotel. 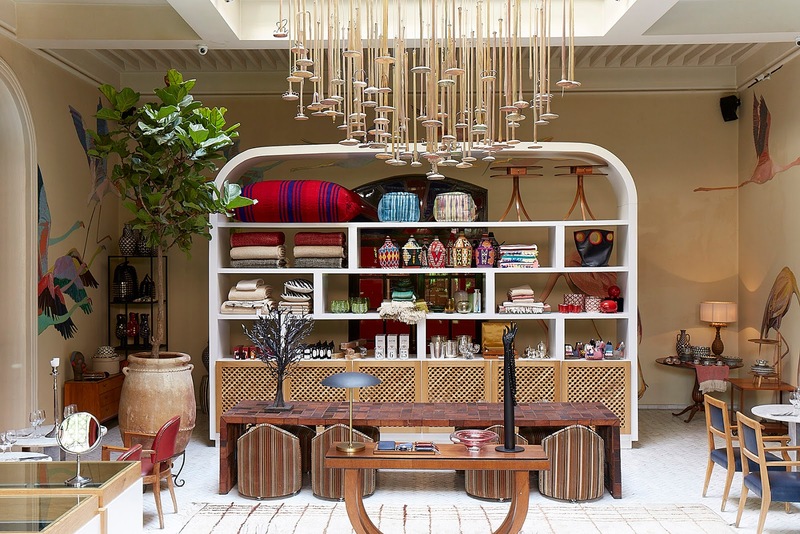 We talked about what it was that drew her to El Fenn, and what she loves about Marrakech, and the many inspirations of this beautiful and alluring city. Come with me. El Fenn is exceptional and rare. Each suite and room at El Fenn has its own style, its own signature colors, and its own quirky architecture and amenities. 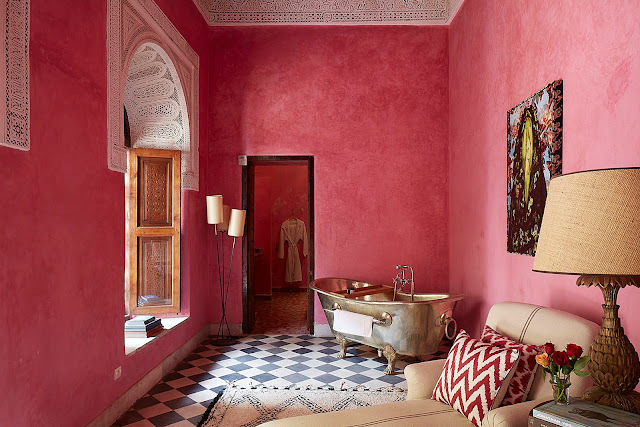 Hand-crafted plaster walls are tinted in signature Moroccan colors ranging from deepest turquoise to shocking pink, terra cotta, blush pink, off-white, rose red, charcoal, mint green and Yves Klein deep blue. 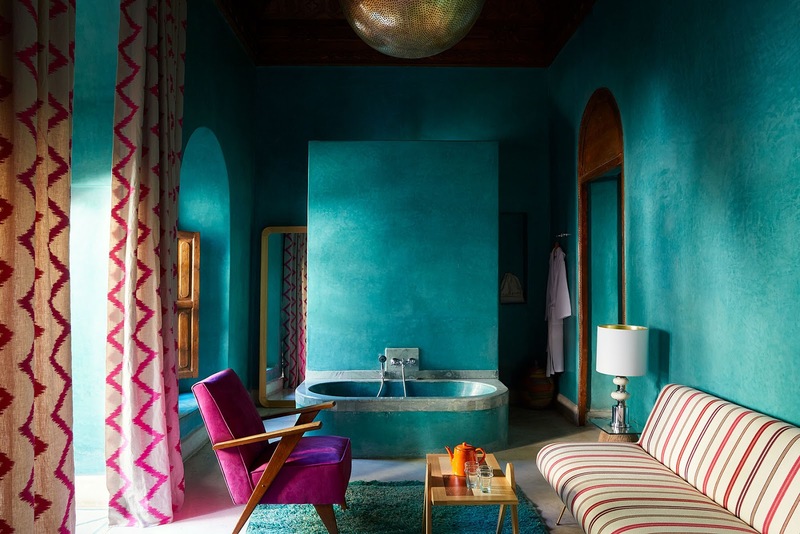 Many rooms have freestanding old-fashioned tubs, and several have wood-burning fireplaces (perfect for chilly Moroccan winter mornings). Some are modern, others are antique. All feel like ‘home’. 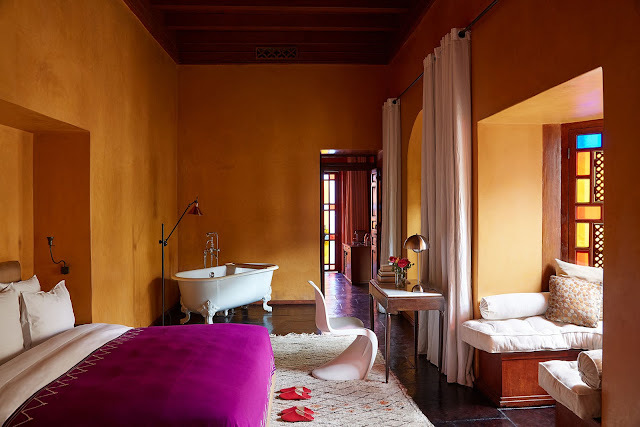 With its enclosed courtyards, swimming pools, hidden stairways, gardens, trees and balconies, the hotel retains a special intimacy yet the hotel is now able to cater for 65 guests across the main building (23 bedrooms/suites, which includes a two bedroom and a three bedroom suite) and a newly-refurbished five-bedroom annex. The three main courtyards are filled with bougainvillea, bamboo and birdsong, and I saw guests sunbathing, and resting with a book in one of the many hidden nooks found throughout the hotel. The hammam and spa are popular spots for relaxing. Groups of friends were gathered at the casual rooftop terrace. 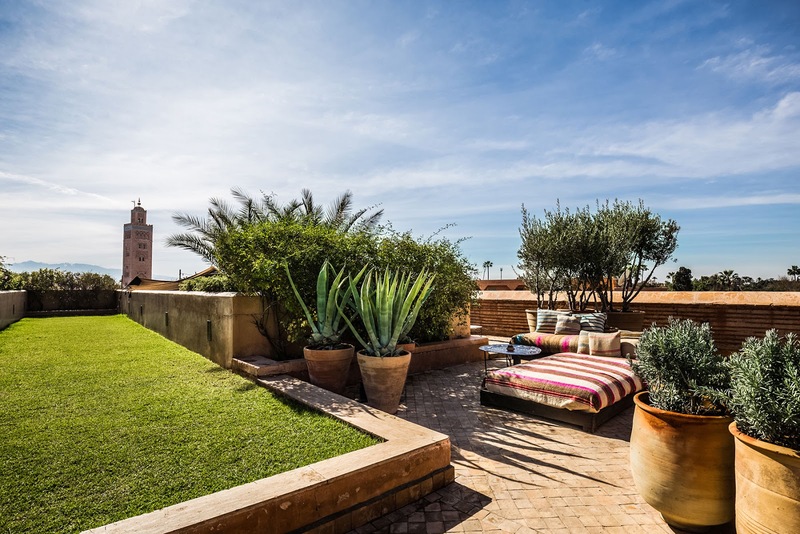 El Fenn’s location beside the Bab El Ksour gate also allows instant access to both ancient and modern Marrakech. The drama and crowds of Djemma El Fna square and the winding alleys and souks are a vivid few-minute walk away. Further afield beyond the old city are the newer shops, bars and restaurants of Gueliz and Hivernage all accessible from a quick taxi ride. 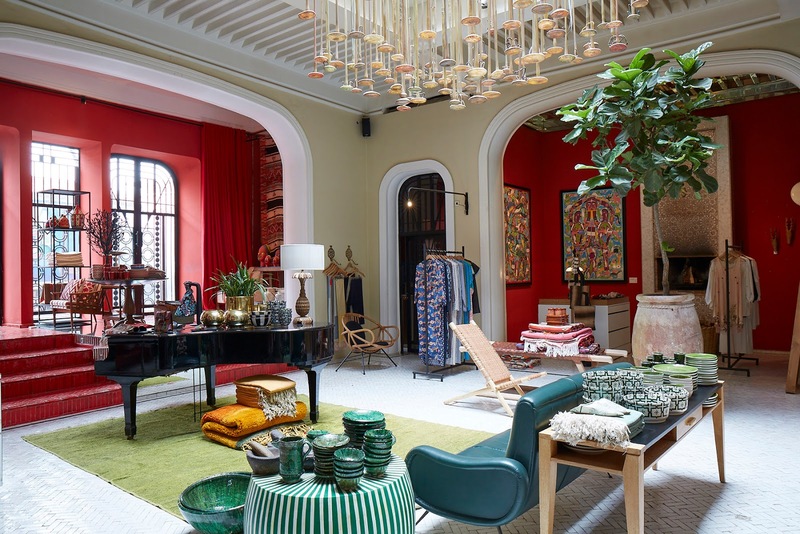 I chatted with Madeline Weinrib about El Fenn. Join us for an insider look. DDS: What do you love about El Fenn? 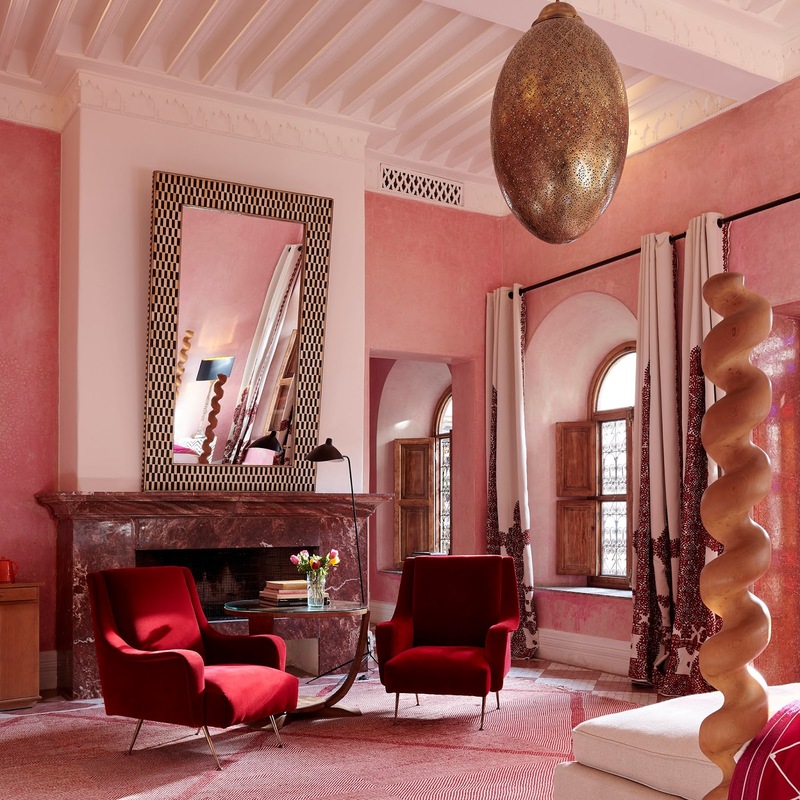 MW: I have been staying there since it was first created in 2004 by my now partners; Howell James and Vanessa Branson. The design is beautiful and the colors and wit and originality I resonated with right away. 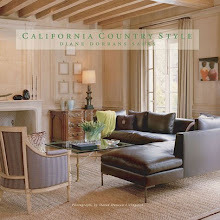 Many of the rooms feel like private apartments, which gives its a very homey feeling. 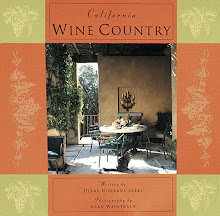 It always has farm to table food and many hidden places where you can just relax. 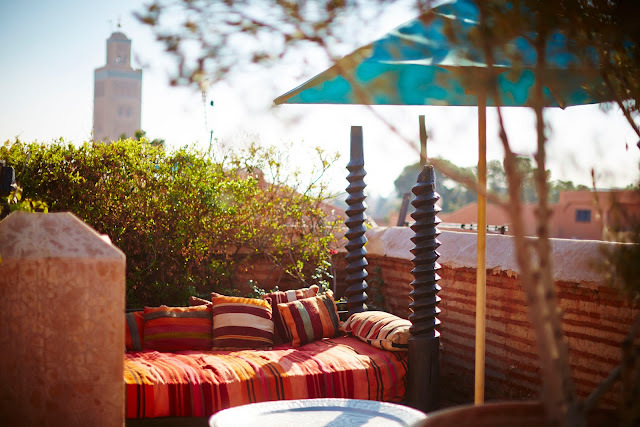 I love having meals on the roof where you can see the Koutoubia (an ancient mosque) and distant Atlas Mountain range. DDS: Which is your favorite suite? MW: My favorite rooms change all the time and I enjoy switching suites and trying new ones. They are all so different. 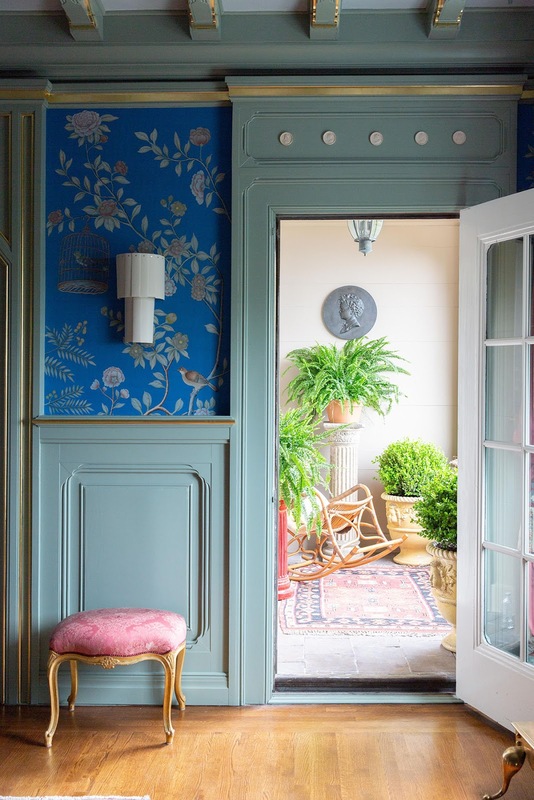 Right now my favorite rooms are off the courtyard. 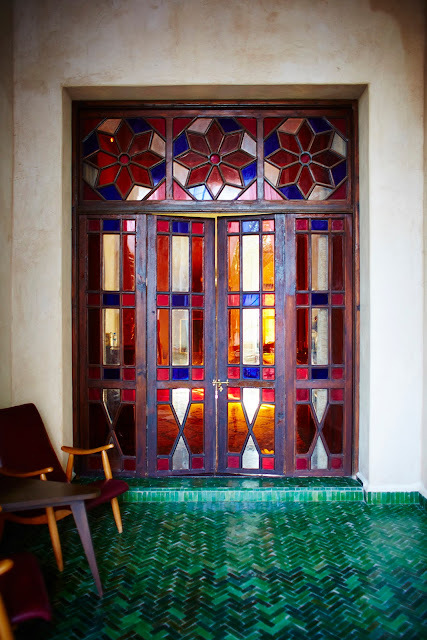 In these rooms, you can hear the birds singing in the orange trees at certain times of the day. It is quite a lovely choir. DDS: The hotel front entrance is almost hidden. 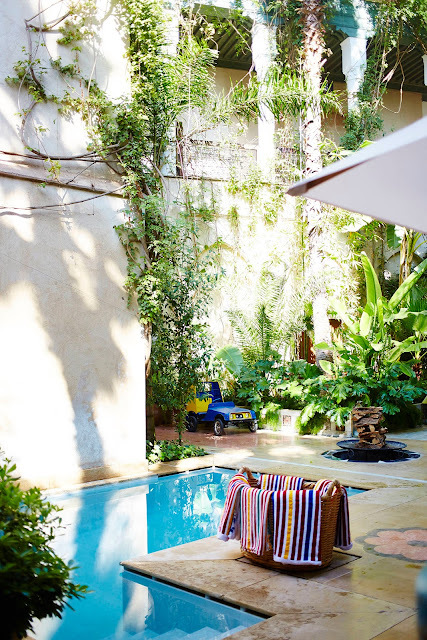 I love that you arrive there and it seems small...and beyond is a series of courtyards and rooms and pools and gardens. MW: Yes, the riad next door to El Fenn became available and we bought it. We are going to add a new courtyard and more new rooms. This, of course, is very exciting. DDS: I love the setting in the Medina. You can walk to many of your favorite shops. MW: The Medina location is kind of ideal because it is closed to traffic. 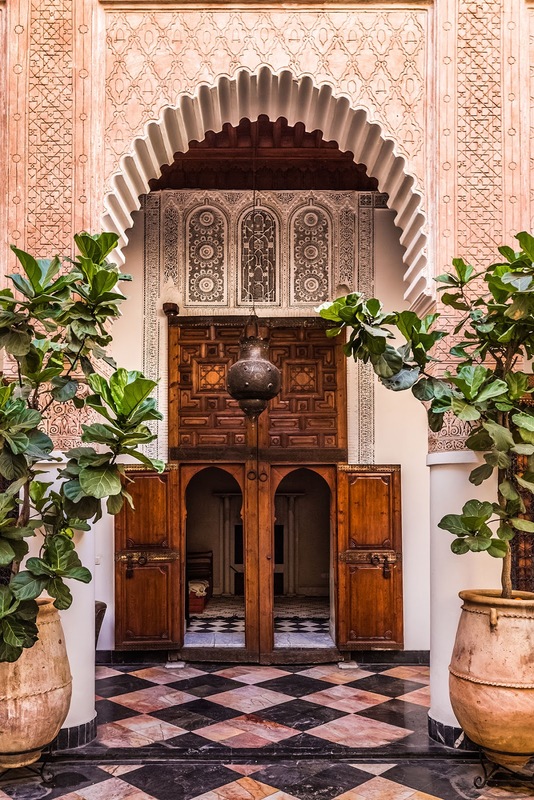 I love the old world of the Medina which was built in the 11th century. Across the way, there is a Sufi mosque and sometimes you can hear mystical singing. Some of my favorites spots in the Medina are the spice market and next to that are the carpet dealers with stalls and stalls of textiles. DDS: How is El Fenn different from other riads? MW: El Fenn is a little different because it feels like home as opposed to a hotel. It is a very relaxed place. 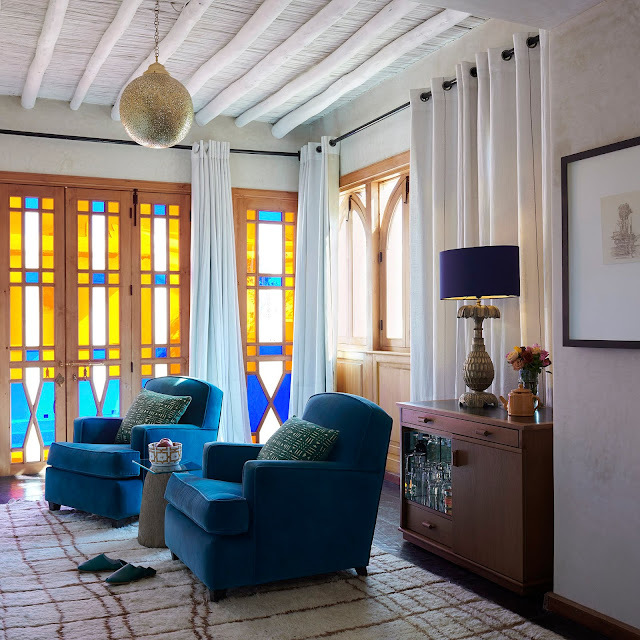 There is also a wonderful mix of contemporary influences and this gives El Fenn a personality all its own. 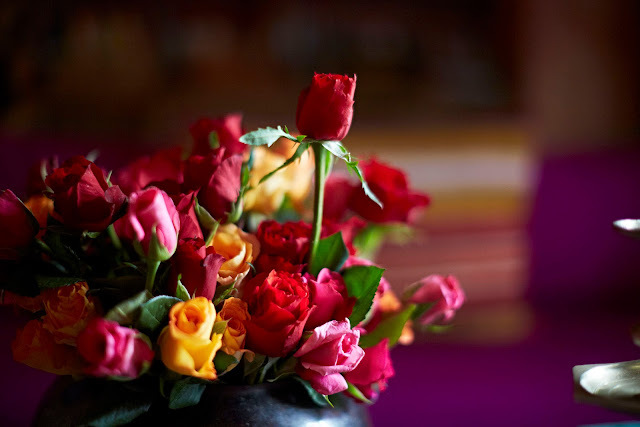 We love color. 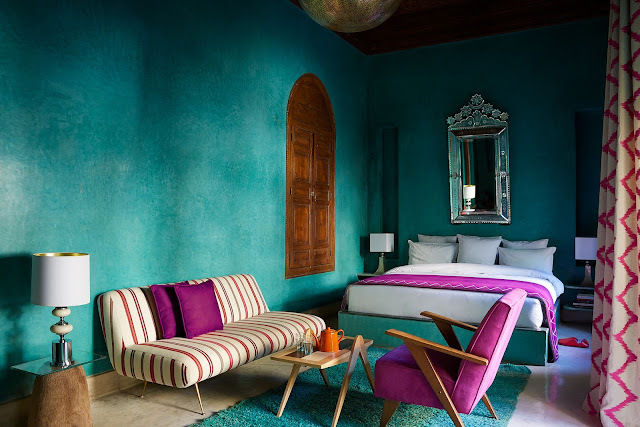 It’s very Moroccan, and very very Marrakech with a jolt of contemporary art and modern furniture. There are art exhibitions throughout the hotel. 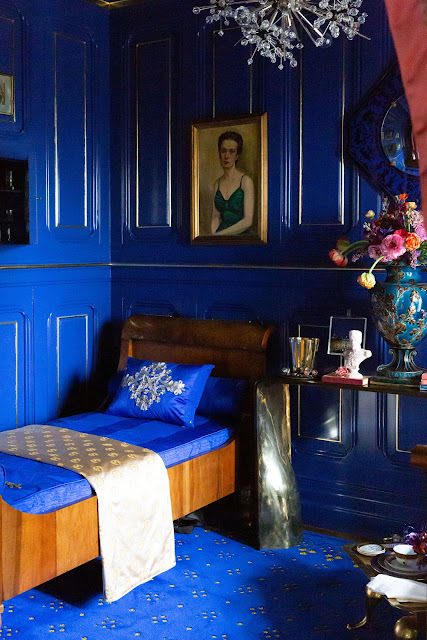 They are primarily Moroccan artists curated by Vanessa Branson. DDS: The shop offers your apparel? MW: I have two collections in the shop. One is fun Moroccan caftans. 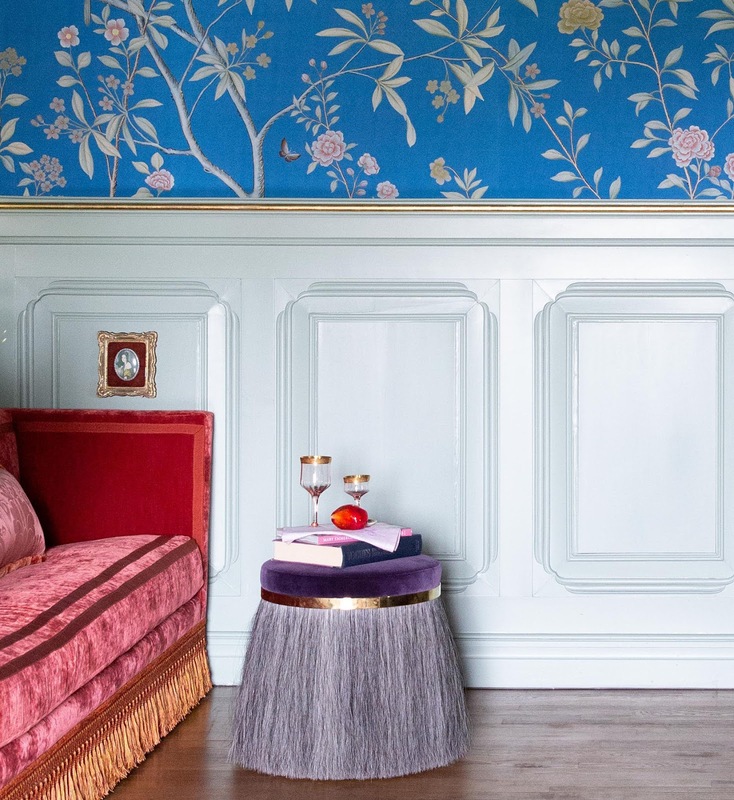 We design with fresh colors. 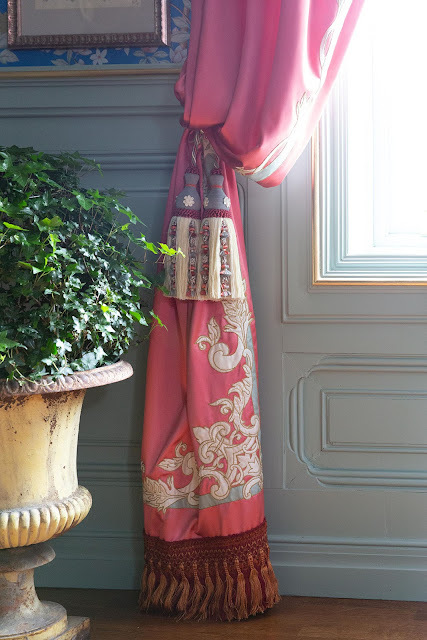 The other is more couture, and very small editions of clothing made in Marrakesh with artisans. 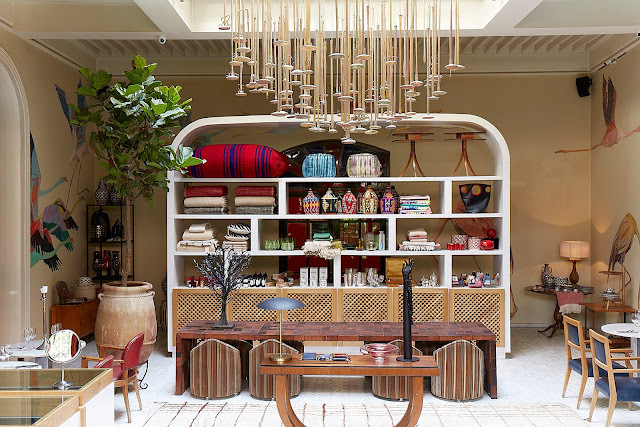 We sell books, baskets, leathergoods, Fes ceramics, kilim throws, jewelry, and many Moroccan fine crafts. DDS: All rooms are very inspiring.I imagine that guests go home and want their bedroom or house ‘Moroccan style’. 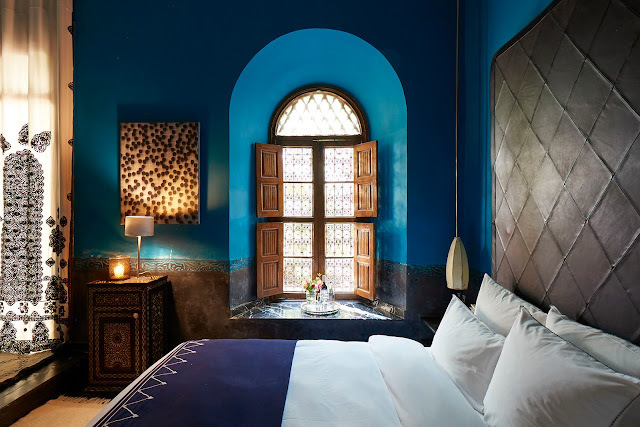 MW: Yes, they do like the Moroccan style but what’s so inspiring about El Fenn is that it’s light-hearted, not pure Moroccan and not aiming for ‘authenticity’. 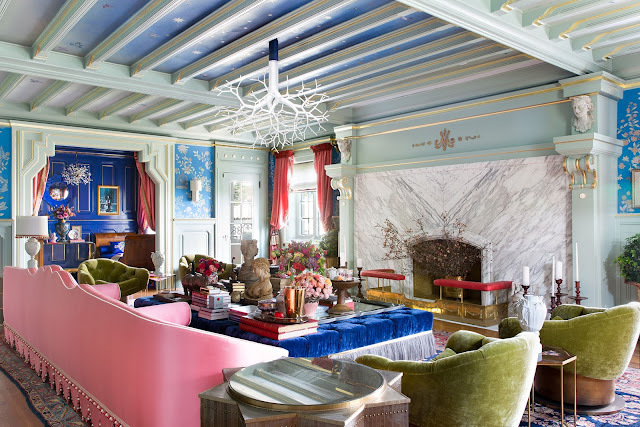 Colors are daring. 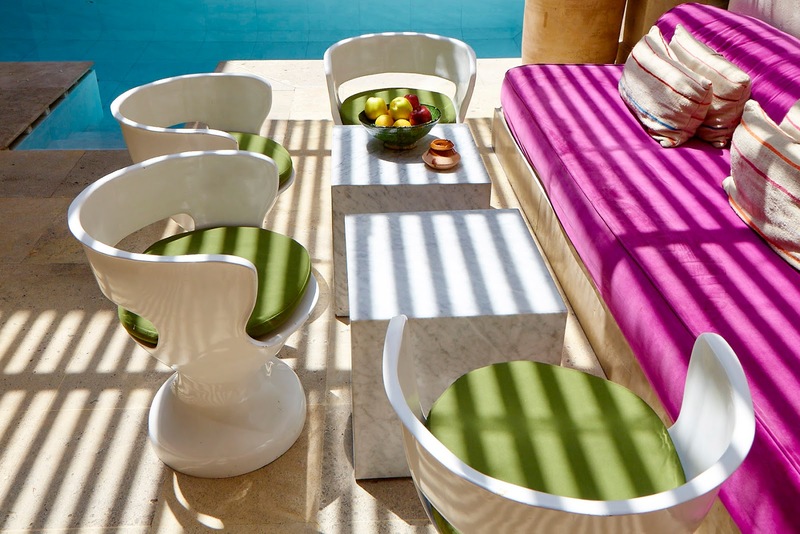 Citron, shocking pink, a splash of aquamarine. 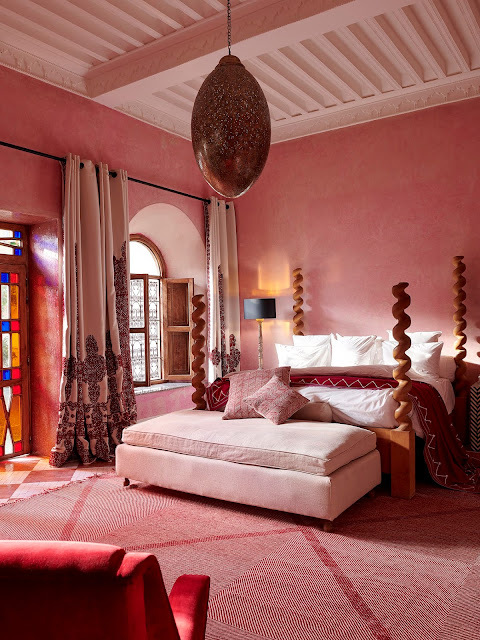 We worked with many Moroccan craftsmen for custom metal lanterns, tables, fixtures, lighting. 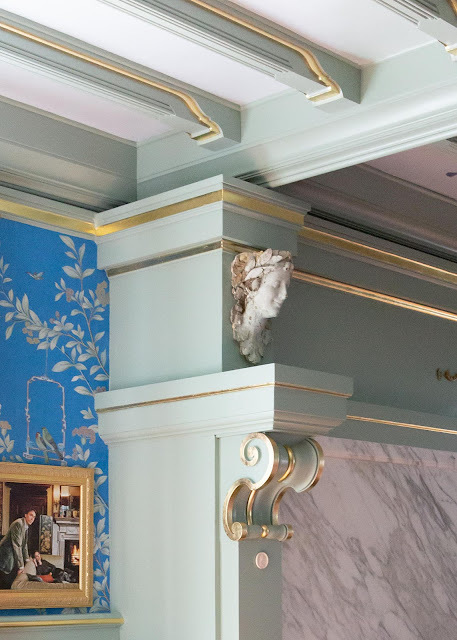 Coffered ceilings are hand-painted. We found vintage Italian design lighting and furniture. We injected contemporary art and photography. 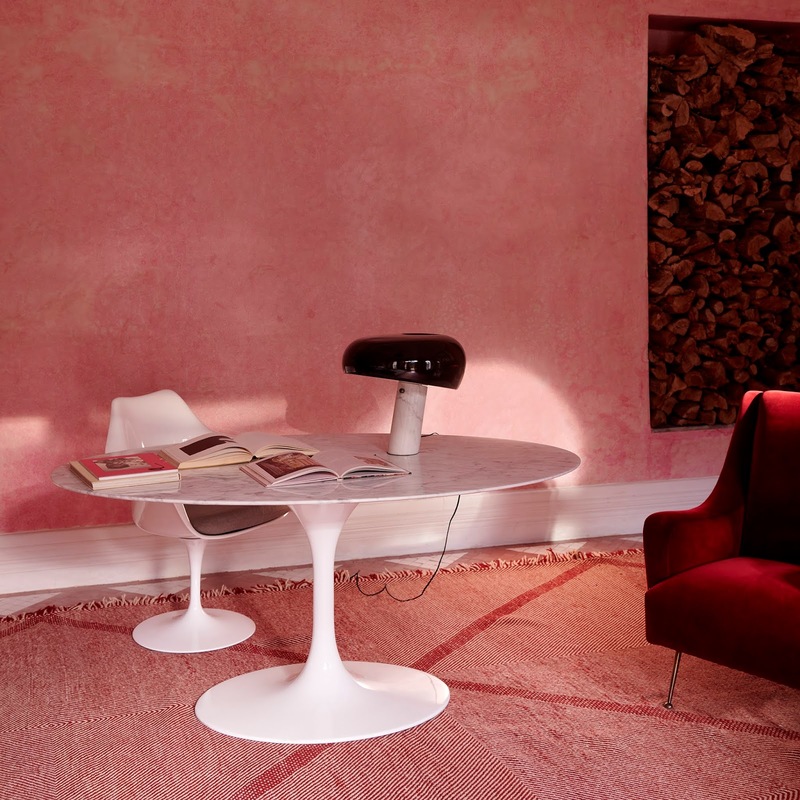 There are new rugs, Moroccan in inspiration, but with unexpected colors. So it’s really the mix that’s makes it so special. 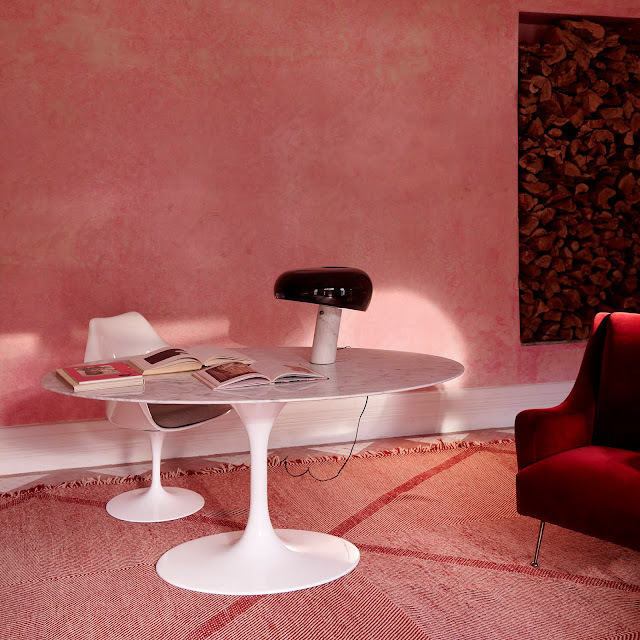 I think that is the freeform and very liveable look that inspires our guests. DDS: At night the bar and roof terrace? MW: Relaxing on the roof is quite special in the evenings. There is a wonderful buzz around and in the background, you can hear the call to prayer. It is all very exotic. 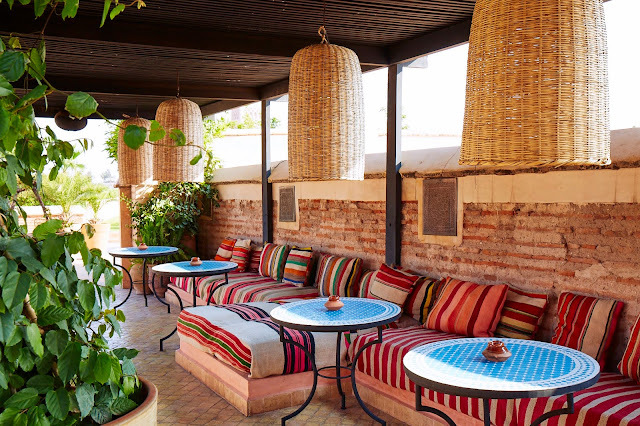 DDS: The cuisine is lovely, very light, lots of salads, and casual and Moroccan flavors. Dishes to share. Tajine. MW: There is no place I would rather have lunch than the roof at El Fenn. It’s a casual spot, guests only, all very international, and the food is exquisite. It's all farm-to-table and every day the menu changes. 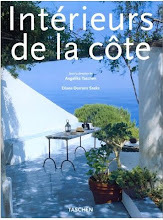 In the evening, they also have the tajine of the day, homemade and absolutely delicious. I absolutely look forward to it. DDS: Thank you, Madi. I can’t wait to return. Basic Info: There are 23 rooms in El Fenn main, plus a 5-bedroom annex. 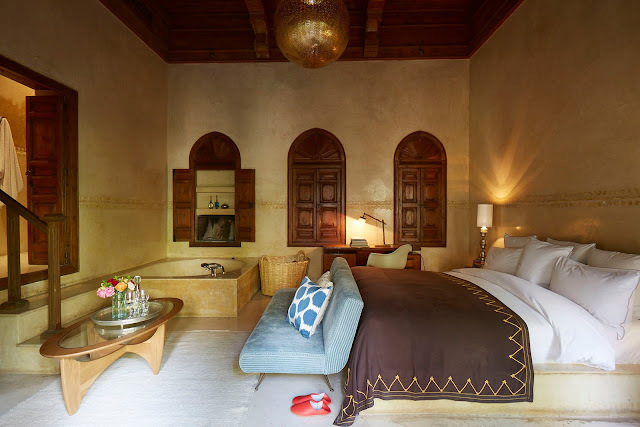 Facilities include a substantial roof terrace, bar, restaurant, boutique, library, spa, family suites, two swimming pools and a plunge pool. Vanessa Branson was born in Surrey 1959. She is the sister of Richard Branson and owns Eilean Shona, a private island on the west coast of Scotland, and El Fenn in Marrakech with a group of business partners. 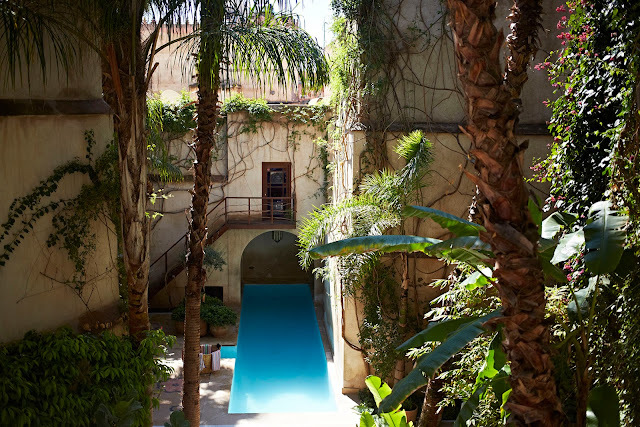 She is also a founder of the Marrakech Biennale. 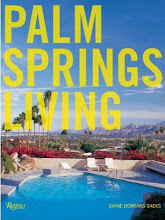 Co-owner Vanessa Branson has built up an extensive private collection of works by contemporary artists over the years. 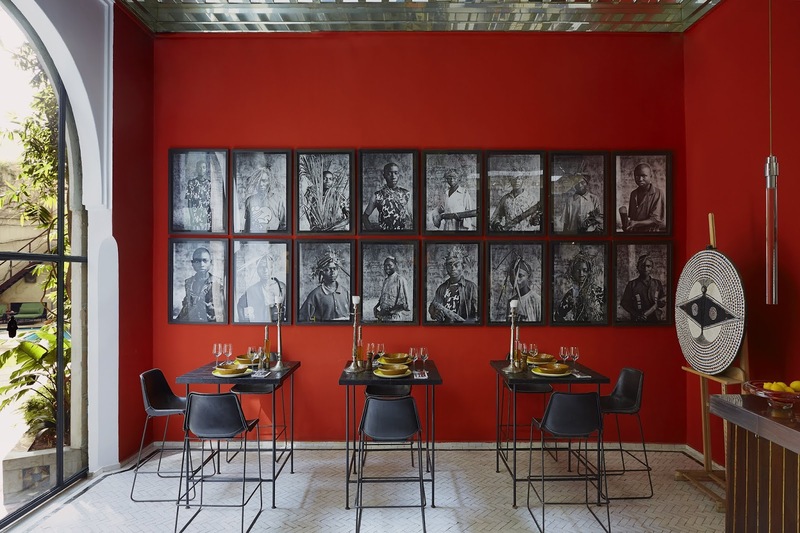 Much of it now hangs in El Fenn where it is considered to be one of the most important collections of contemporary art in Morocco. 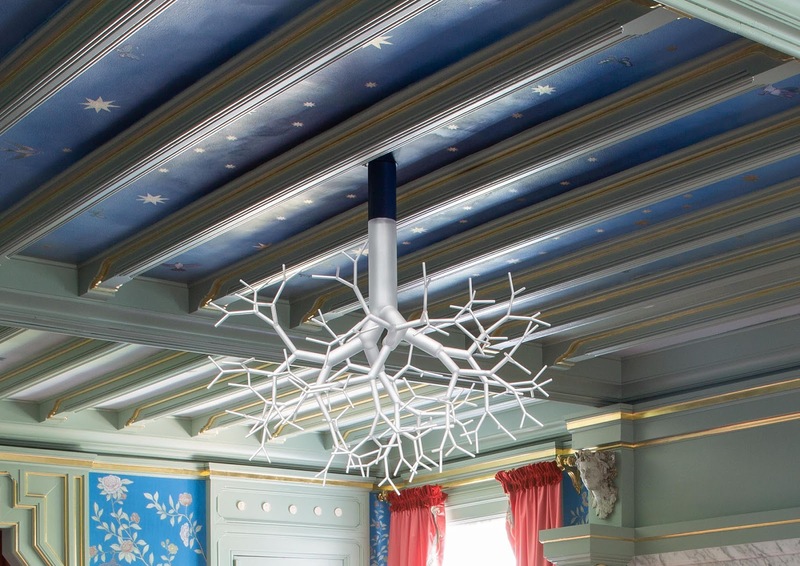 With art works seen throughout the public spaces and bedrooms, guests may find themselves dining under a stunning chandelier created by Francis Upritchard or sleeping beside a series of ink studies by Antony Gormley. 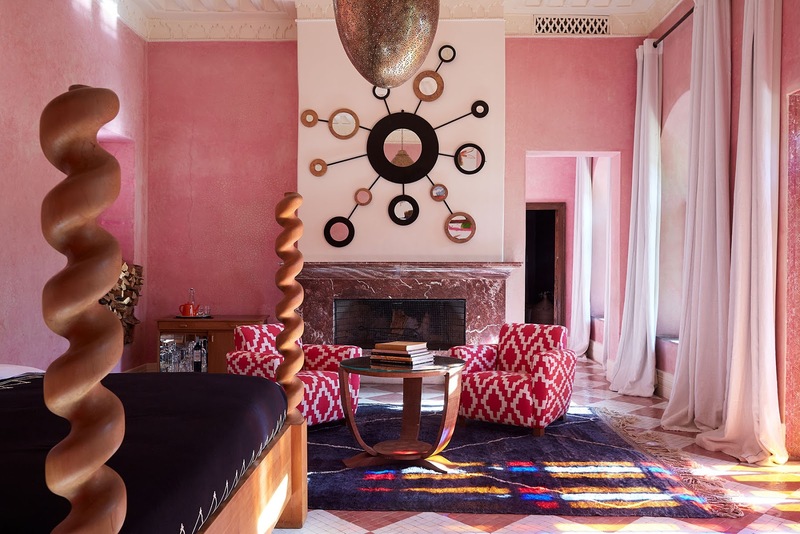 Artist, designer and arts philanthropist Madeline Weinrib, based in New York, was the founder of the highly acclaimed textiles and rug company, Madeline Weinrib. 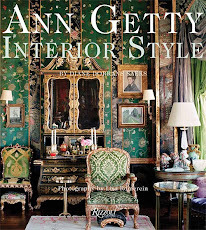 She is credited with introducing luxurious authentic ikat fabrics in modern colors into the design vocabulary, and popularizing and developing Moroccan and Indian rugs into American décor. 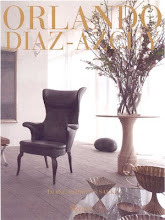 Graham Head, Madeline’s husband, is the President of ABC Carpet and Home in New York. 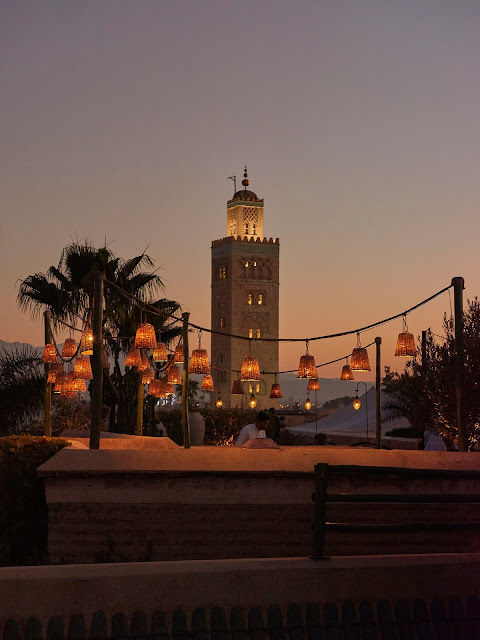 From the roof terrace, which has several outdoor restaurants and a bar there are views of the minaret of Koutoubia mosque and in winter and spring the snow-capped Atlas Mountains range. 2 Derb Moulay Abdellah, Ben Hezzian, Bab el Ksour, Marrakech, Morocco.